The Black-faced Lion Tamarin was first documented in 1990. This Lion Tamarin has a golden body, and a black-face hence the name. The feet, tail and man are also covered in black hair. They are about 30 cm (or 12″) in length, and they weigh in at around 650 grams (21 ounces). They have long digits, and claw like nails. This aids in feeding on small insects and other such vertebrates. 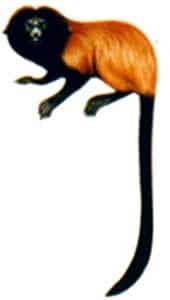 The scientific name caissara was given to the Black-faced Lion Tamarin after the fishermen who lived on the island where it was first documented. It is critically endangered (2003), and the decline was mostly attributed to habitat clearance by humans to make way for tourist attractions. They feed on insects, plants, fruits, nectar and other such food sources. They will often occur in groups of two or more, and during feeding they will often share the food sources. They have a long vocal call to signify their territory and establish their presence. They give birth to two or more young, but triplets and quadruplets have also been reported. They usually give birth in September through March. E-mail to add your Black-faced Lion Tamarin related website.